LOL. You’re making me crave a rainbow anything. When I was getting ready to retire, I realized that one of my lifelong desires was to “be Norm”. No, not normal. Norm, from Cheers. I wanted to have a place where everybody knew my name. And it wasn’t until I was ending my career that I realized that was work. There were 100 individuals in my technical area, and I knew 95% of them well enough to have a conversation about them – their interests, their family, or at least their work project. The woman taking over my role knew less that 45% of the them – we went over the list of folks and she was “who is this?” for so many folks. Yes, it worried me! I know it wasn’t a big part of my role, but I enjoyed knowing people and people knowing me. Yes, the introvert in me enjoyed it – I was Norm when I walked into amy meeting! I no longer have a place that people know my name. I understand it takes regularity and repeatability. With our recent move and then me being in cancer treatment and avoiding people a lot (I really, really cannot afford to get the flu this year! ), I have not even started to find that place. And I miss it. A lot. Hopefully you’ll find a place in your new location that is as welcoming…even if they don’t serve unicorn rainbow anything! Your comment and Susie’s comment made me realize that my employment environment also was a place where everybody knew my name and was always glad I came. Yes, I was Norm in my workplace, as well. I love that! I do miss that rich, aged web of connections that I had with my work “family.” I do keep in touch with most of the folks who were most important to me while I was working, but it isn’t quite the same as being “home” with them. On the other hand, I am starting to develop those networks of people here in Florida, but I think the complexity and richness we think of in the “Norm effect” takes lots of years of relationship. I am sure I will find a new literal and metaphorical Cheers! Thank you for making me smile today!! I love your rainbow and unicorn enthusiasm!! You surely brightened my day!! 🌈 and 🦄 4 ever!!! My place where everyone knows my name is my old work site. They all know my name and are happy to see me when and if I visit there. We catch up on the latest news with everyone. I do associate with a few of them for breakfast, lunch or dinner here and there at times and that is how they keep tabs on me and my travels and family. The bagels look delicious. Are the rainbow bagels flavored with all those colors? I’m tempted to order a dozen, but they are strictly off my diet. No breafs. Based on your comment and Pat’s, I realized that is something I miss from working… a lot of people knew my name and considered me part of the gang. After spending 33 years of my life employed in the same circle, it was a kind of family. Susie, you are too good. I think I might just dissolve into a pile of goo if I banned bread from my diet. The bagels are delicious. 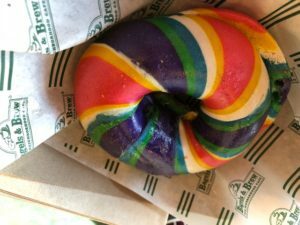 The unicorn bagel is just multi-colored, not multi-flavored, but still delicious! Next Next post: If Life Is A Highway, Did I Take The Wrong Offramp Somewhere?